For the second year in a row, the new Summer Scholars program hit one out of the park. 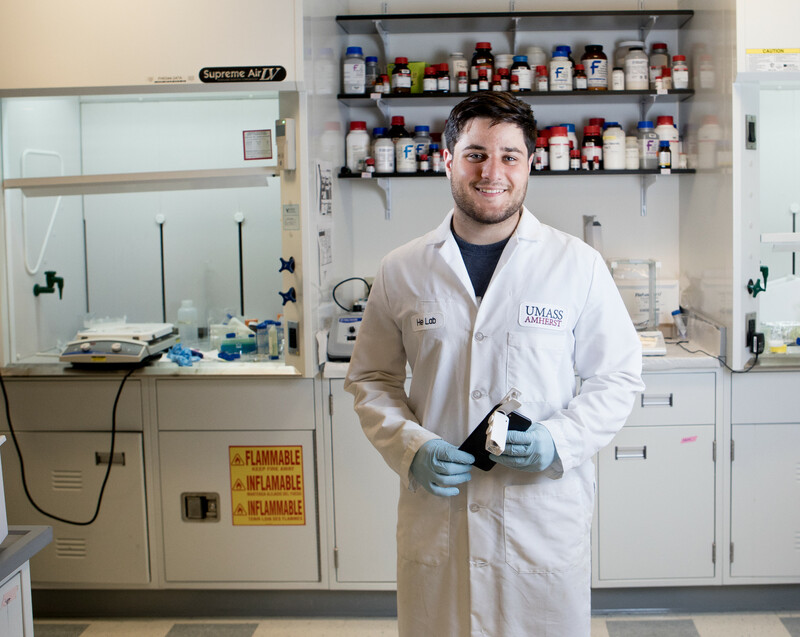 With the help of generous external donors, the Center for Agriculture, Food and the Environment (CAFE) offered 38 UMass undergraduates a few months education in the real world. 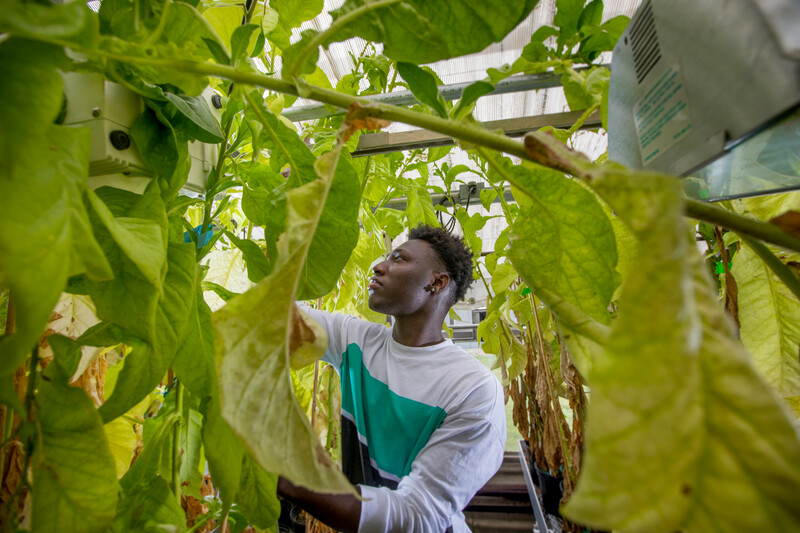 The students worked alongside professors and extension educators getting a taste of research and outreach education in settings as varied as a campus laboratory, a restored wetland and a farmer’s field. You might have found them in Wilbraham, Wareham, and Worcester… in Plymouth, Framingham, and South Deerfield. In wetlands, forests, fields, and bogs (along with the fungi, salamanders, and bees they were studying). You might have seen them on the UMass campus wearing lab coats and peering through microscopes. One thing they had in common: they were all in pursuit of meaningful and measureable impacts. Four summer scholars will be well-remembered in the third largest city in Massachusetts after their work this summer. With both individual and collaborative projects, Tara McElinney (’19), Jack Mulcahy (’20), Matthew Cieboter (’19) and Jasifa Chowdhury (’18) delivered energy and information to diverse groups of urban residents. Collectively, their work advanced goals for greener neighborhoods, increased environmental awareness and promoted a meaningful climate adaption policy for a healthier city. Tara McElhinney‘s energetic disposition is a perfect match for the goals of extension and community outreach. This summer she was on a mission to promote awareness of and appreciation for a greener Springfield among residents of all ages. Her energy proved a plus when interacting with neighbors at Abbey Brook Conservation area and watershed in east Springfield. This watershed has been identified as having great potential for strengthening neighborhood connections to the land. McElhinney’s summer work was part of a continuing cooperative effort to promote conservation values with residents, especially young people. Since 2012, the University of Massachusetts, USDA Forest Service, the City of Springfield, and ReGreen Springfield have been working collaboratively to promote access to urban forests and community green spaces in the city. Abbey Brook is known to have high levels of iron and McElhinney led residents to collect samples. They measured dissolved oxygen, pH levels, and conductivity of the water at three sites to assess the stream’s health. U.S. Fish and Wildlife Service checked for iron levels and acidity and reported back to neighbors with the hope that local residents will come to more fully embrace environmental stewardship in their backyards. McElhinney also interacted with K12 students at public events. Activities were designed to share natural wonders of the city and to strengthen students understanding of animal life in nearby woodlands. At the ‘Wacky Wildlife’ session, over 50 students attended. At first tentative and then becoming gradually more enthusiastic, they got familiar with wildlife including frogs, mallard ducks, salamanders, and chipmunks. Jack Mulcahy (’20), a Springfield native, could be found during part of the summer up to his knees in dirt, collecting tree and soil data. His goal was to provide scientists information that will assist them in assessing and shaping local responses to climate change. Mulcahy worked closely with David Bloniarz, UMass adjunct professor, long-time proponent of ReGreen Springfield and supervisor on this project. As a result of collaborative efforts, 3,000 new trees have been planted in the city since 2012. Mulcahy’s work was part of a wider effort to encourage more citywide sustainability. He measured trees and assessed their health, height, width, species and canopy cover. And he often wielded a shovel to collect soil samples throughout Abbey Brook watershed in order to obtain a full structural and chemical analysis. Once a week, McElhinney and Mulcahy worked together to organize educational seminars in the Abbey Brook watershed. Themes ranged from invasive species and local birds to tree characteristics and watershed quality. 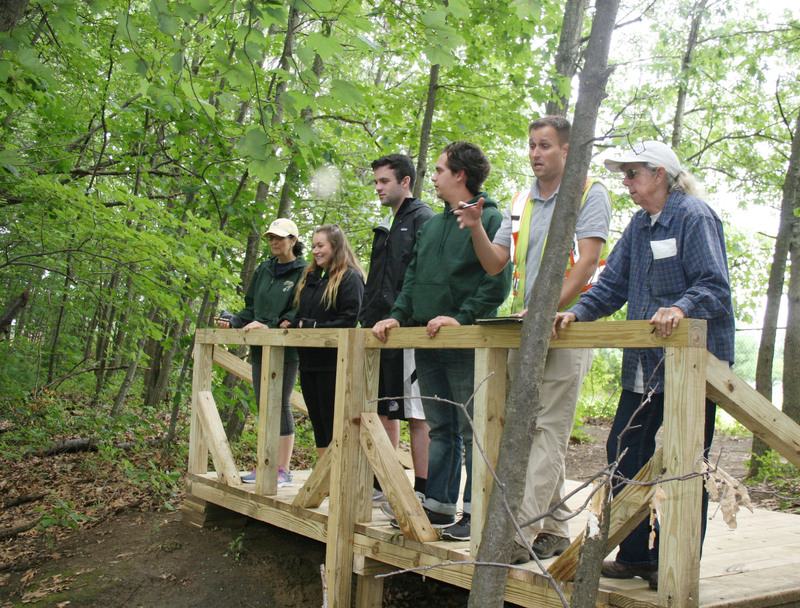 The goal was to inspire interest and raise awareness of environmental conservation efforts around the brook. (Currently, underutilized trails with a healthy forest canopy and a small brook meander through 70 acres within the conservation area.) One way they ramped up greater resident interest was to help post new interpretive signage throughout the forest. Twenty signs were affixed to trees to educate hikers about topics including butterfly cycles, stream water, animal tracks and Lyme disease. McElinney and Mulcahy’s Summer Scholar experiences were both funded by the Massachusetts Grange. Matthew Cieboter (’19) has been a dedicated tree volunteer with ReGreen Springfield for seven years, motivated by the tornado that ripped through his neighborhood in Springfield and uprooted thousands of trees in 2011. Soon after that event, he met Dave Bloniarz and became a dedicated volunteer. This summer, Cieboter was focused on the young people who spend time among the trees. Working with extension assistant professor Michael DiPasquale, he spent the summer interacting with teens who live near urban parks. His purpose was to learn what they knew about parks in their own neighborhoods. He conducted a survey to assess if they used these green spaces and how much. Cieboter’s questions were intended to help understand public policy around sustainable design, access to public space and environmental justice/equity. He honed his interviewing skills with young residents by first establishing a comfort level to evaluate sensitive issues around racial and environmental justice. His supervisor, DiPasquale, offered this summer opportunity to gather data on a larger research project he is working on regarding "equity" in the distribution of open space in Springfield and other similar cities. He is interested in knowing if some neighborhoods or cities have more access than others as part of an ongoing “Revitalizing Legacy Cities” project. Jasifa Chowdhury (’18), a second generation American from Bangladesh, hails from Cambridge. Her heritage has helped to create a passion about the work of climate adaptation. Chowdhury said there is so much water on the Indian subcontinent that adaptation has just become a way of life. For example, because schools are often inaccessible because of high water levels and frequent flooding, “boat schools” are now the common modification, bringing education directly to students. Working with Elizabeth Hamin, professor of regional planning, Chowdhury helped to develop a policy proposal for cities and towns to overcome barriers to climate adaptation planning. She poured over local plans and state initiatives synthesizing data to create a policy brief. Her advice will be shared through on the resilientmetro.org website, making it easier for municipalities to implement needed changes in response to climate change realities. She analyzed geographical vulnerabilities (low income, hardscapes with hot pavement and less tree canopy) and social vulnerabilities (Latino communities, gender, race and class issues) to understand how these factors affected issues of environmental justice in specific neighborhoods. Further stories on the work of this year’s summer scholars. 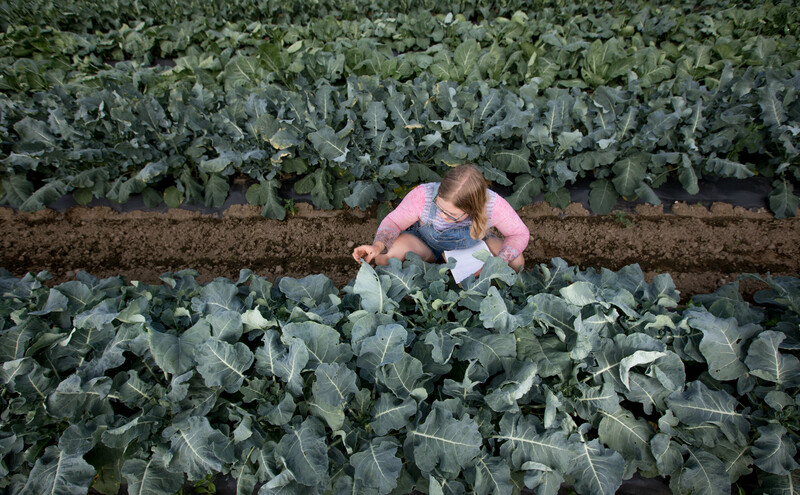 The CAFE Summer Scholars program has been made possible for two years by the generous financial support of the Massachusetts Grange and the Massachusetts Society for Promoting Agriculture. Cover photographs by John Solem.